Sydney Shop Girl: The film that made me a more connected citizen of the world. The film that made me a more connected citizen of the world. Written in response to the blog this challenge, number 42. A film that has inspired me or changed my life in some way. I have to admit that outside of work related research and education, much of my interaction with the media was decidedly light weight and largely irrelevant in the general scheme of the world. There were years when my treat to myself after a run of night shifts was to stop off at the 24 hour servo on the way home from that last shift of 5 and buy myself both NW and Who weekly and stay up until lunchtime reading them. I'd only read the local newspapers and Perth readers will know what a broad view of the world (not) The West Australian depicts. I did dip my toes into the 7.30 Report and 60 Minutes from time to time. I know about The Gulf from CNN. And that, sadly, was really just about my grasp of current affairs both in Australia and overseas. 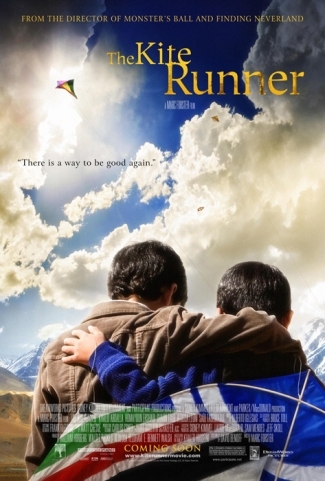 The Kite Runner is a film that really changed by perception of the world beyond Australia, the US, the UK and South East Asia. Which for the first 30 or so years of my life represented the world that I had any real interest in. To briefly summarize the film, it tells the story of Amir, a young boy from a wealthy and priveleged background in Kabul who is friends with Hassan, the son of Amir's servant. The backdrop to this is Afghanistan and its invasion by the Soviet Union, the Taliban regime and the passage of Afghan refugees to Pakistan. Amir and Hassan are united by kite flying which is a hobby of all the men in the city. On the surface, they seem 'equals' and they have a boyish friendship. However, the friends revert to the master and servant relationship by Hassan taking a degrading punishment for Amir. They become distant for a number of reasons which puzzles the boys' fathers. Events unfold that see Amir being able to flee Afghanistan and start a new life, under much more redeuced circumstances but unfortunately Hassan dies. Amir, holding the guilt of the past in his heart, returns to Afghanistan to help Hassan the only way he can. I hope that summary doesn't give too much away. This was a film that normally wouldn't even register on my consciousness. However, Mr SSG got the DVD and we watched it together. I found the images of Afghanistan very confronting. The film had both a deeply personal emotional plot and also the larger picture of the plight of Afghanistan and somehow both grabbed me and stayed in my mind all this time since I saw the film. Watching the film made me question aspects of my life. I live in a country with a higher standard of living, with a freedom of religion, thought and self expression few other countries have as well as access to an incredible amount of uncensored educational material online and in the press. And all I really knew about was the lifestyles and daily movements of celebrities. It was a very humbling realization. I've been on a bit of a journey since then - to become a more informed citizen of the world and to develop interests outside of work that extend beyond celebrity gossip and shopping. I've been listening to more of the world news on NPR and the BBC, I've downloaded their podcasts and I actually listen to them whenever I can. I've made a conscious effort to cut back on the gossip content of my weekly reading. I culled my email mailing list subscriptions of all the fashion/shopping/gossip websites I used to frequent. I decided that my inbox should be more of a reflection of my varied interests - professional updates, Christianity, news site updates, photogrpaphy tips, yoga commentary, recipes and just a few adverts for things I like to buy. I have mostly kicked my gossip magazine habit. I subscribe to only 2 personal interest magazines (one for cooking and one for shopping) and only buy the gossips for long weekends or when I fly. I actually read or at least open my professional journals. The Kite Runner pretty much woke my brain from a deep slumber amongst the layers of fluff, gloss and skewed priorities of popular culture that I had chosen to bury my mind in. It helped me put my interests into perspective, I still enjoy the things 'the old me' did but that enjoyment is not all encompassing or all important. There's more depth and breadth and I am proud of this. I am well on my on a personal journey to become more connected to and informed about this world I live in. Great post SSG! It amazes me how much useless (often celebrity-related) info I have accummulated in my head all these years. I suppose they provide an easy escape from the stress and troubles in our lives. But like you, I want to be more connected to the rest of the world. And be more aware of the plight of millions of unfortunate souls around the world. What a wonderful post, I really enjoyed reading this. I have to admit I haven't see the film but I have the book, in print and an e-version. Have to admit, I haven't seen the film but I have the book. Very thought-provoking. Ah, I've been wanting to see this but I had thought I'd like to read the book first. Thanks for the reminder, I'll check in with my library when I get home next week. Its far too easy to be trapped in frivolity and forget the wide world. Good on you for allowing yourself to be moulded, its a inspiration for the rest of us.